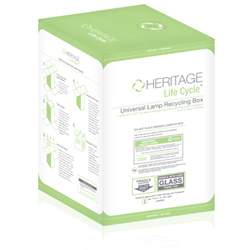 This UN rated Lamp Recycling Container holds approximately 45 - 90 Compact Fluorescent Lamps (CFL's), or up to 50 lbs. of mixed lamps including small fluorescent bulbs, U-Bends, Circular, HID (high pressure sodium and metal halides), halogens, and LED Lamps. Kit includes container, liner, instructions, shipping to your facility and prepaid return shipping and recycling). Dimensions: 24-7/8" x 16-1/8" x 16-1/8". Instructions are printed on the box for ease of use. Sale of this item prohibited in ME, AK, PR, and HI. DO NOT place PCB Ballasts or non-PCB Ballasts inside this kit. Non-conforming material is subject to additional charges and fees.